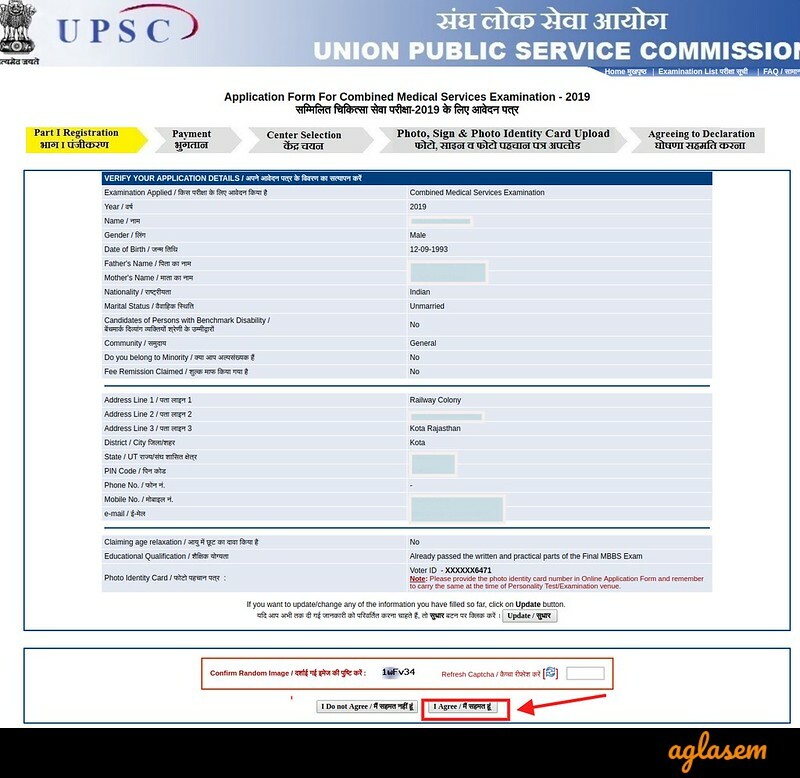 UPSC CMS Application Form 2019 – Union Public Service Commission (UPSC) has opened the CMS Online Registration 2019 window on April 10, 2019, at upsc.gov.in. The deadline to submit the UPSC CMS 2019 Application Form is May 06, 2019. The candidates who have completed the MBBS and are below 32 years can fill the form by submitting the application fee of Rs. 200/-. The Commission will also open the window to withdraw from May 13, 20, 2019. The application fee will not be refunded, in case of candidate withdraws the application form. 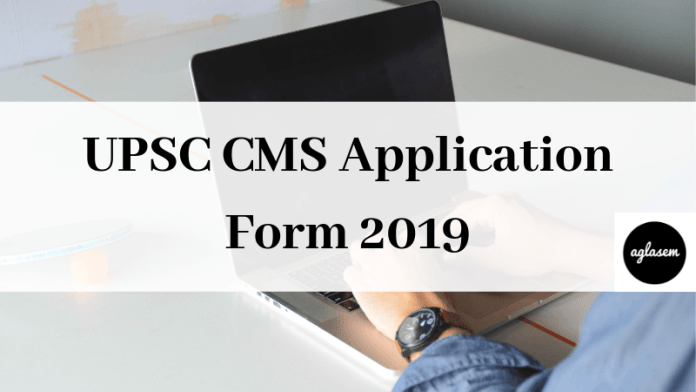 Get here all the details of UPSC CMS Application Form 2019. Latest: The UPSC CMS Online Registration 2019 has been commenced. Scroll down to apply. The interested candidates can apply against 965 vacancies. while filling the application form the candidates have to choose the name of the post. Apply Online: Click Here to fill the UPSC CMS Application Form 2019. There are some important points which a candidate should go through before filling the form. Ensure the eligibility is mandatory before proceeding. The application form will be in English and Hindi language, but the candidates can fill the form in the English language. There are two parts in the application form, and candidates have to fill both parts of form i.e. Part I registration and Part II registration. The mode for submitting the application fee, are online and offline both. Keep ready scanned photograph, Signature and pdf of identity proof. Once a candidate submits the application form, he/she will not be able to edit the form. So it is suggestable to fill the form correctly in one go. For doing the registration, the candidates must submit the application form online. For UPSC CMS the candidates have to pay the fee as per their category. Application Form for Unserved category candidates is Rs. 200/-. For SC/ ST/ PWD and women candidates the application fee is nil. If the mode of payment is online, the candidates can use the Debit Card, Credit card, Net Banking, etc. Or if the candidate is using the offline payment mode then the candidate can use the offline challan and deposit it in the nearest SBI branch. An identity document has to be uploaded while filling the form. The identity form can be anything of Aadhaar card, Voter Id card, PAN card, passport, Driving license. The candidates have to upload a recent photograph of his / her. The signature of the candidates should be in the form in scanned format. 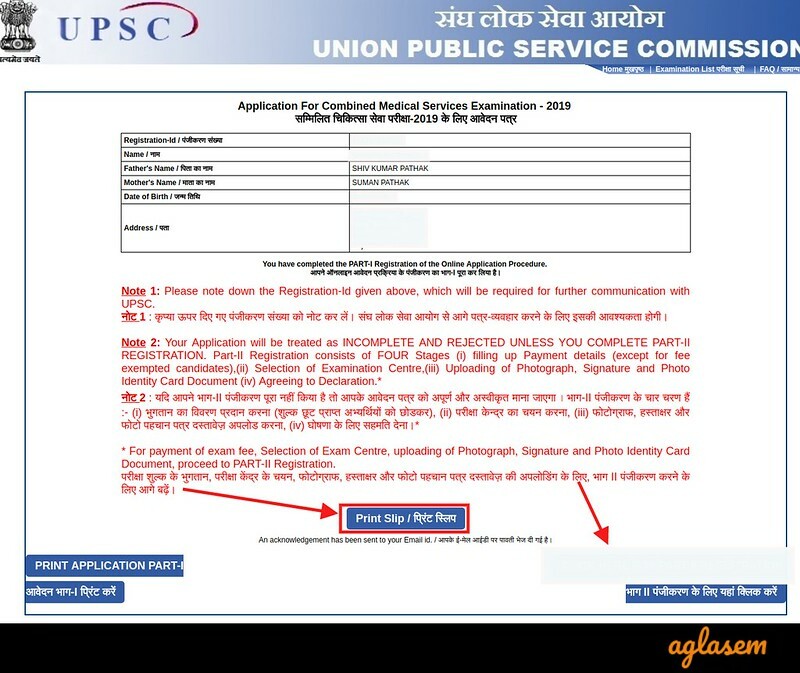 How To Fill UPSC CMS Application Form 2019? So let’s get started with the process of filling the application form. At first, the candidates have to click on the above link, the link will redirect them to the official website. 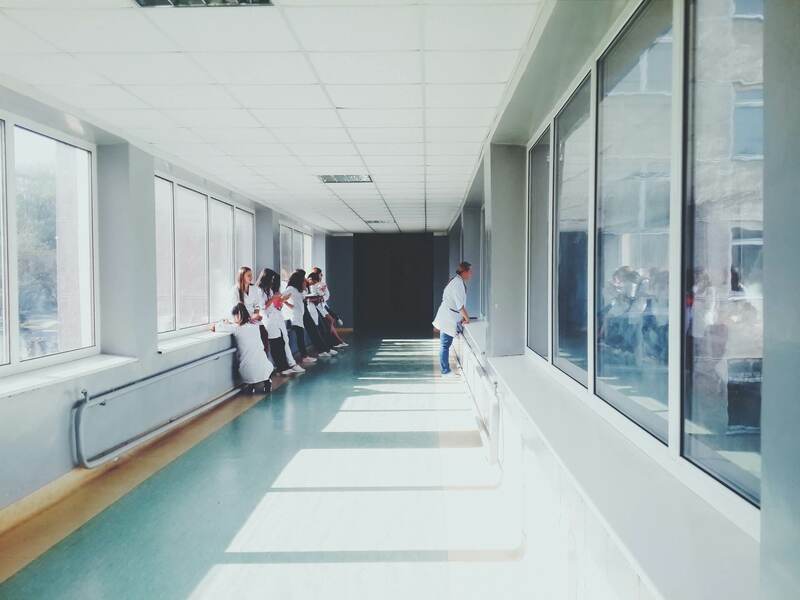 Thereafter the candidates have to click on the “Click here for part I” in front of Combined Medical Services Examination. On clicking on the link, the instruction page opens. The candidates have to read all the instruction carefully, after that they should proceed for filling the application form. After clicking on the proceed button a general application form opens with the following fields. Once you fill all the details and submit them, another page opens, naming Selecting the Age Relaxation, here the candidates who wanted to claim the age relaxation have to fill the details. The further one is to Provide the identity document details. The very next step of the application process is previewing the application form details. Here the candidates can cross check all the details and can edit if there is any mistake in the form. 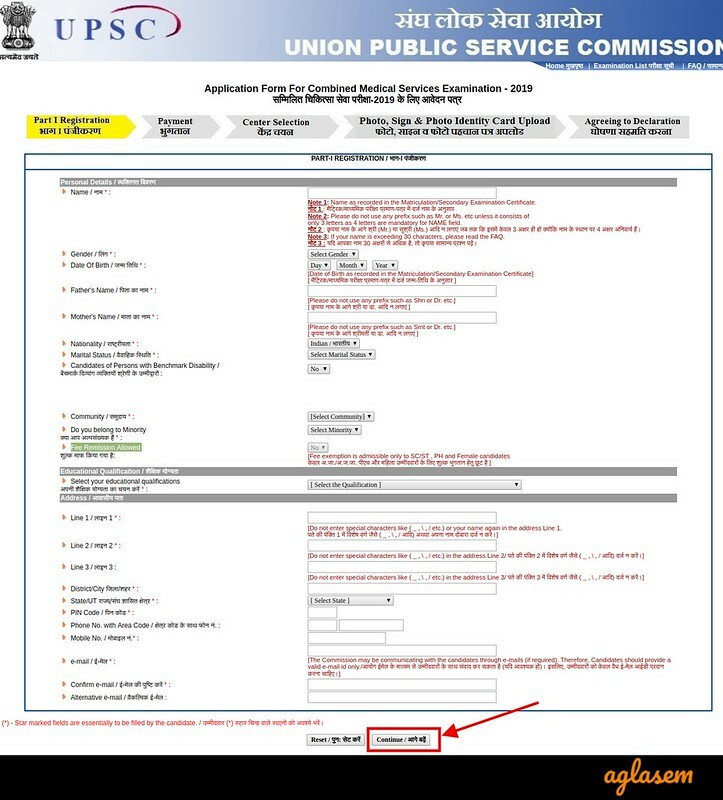 Once the candidate admits and submits the application form, the Confirmation page appears, here the candidates have to take the print of Confirmation page. As we mentioned above the second part of registration have fours steps. Payment: The candidates have to pay the application fee in any mode whichever suits them. Center Selection: The candidates have to select the center for the written exam. The candidates have to select the exam center from the drop-down menu. The exam centers are subject to the availability if a center reaches the capacity, they will be frozen, and the candidates will not be able to select that particular center. Because UPSC does center allotment on first – apply – first – allotment basis. In this section, the candidates have to upload the photograph signature and document of identity. Here the candidate has to agree with the declaration. This was the last step, and the process of filling the application form has been completed here. UPCS releases the admit card of CMS for online examination 02 weeks prior to the examination. The candidates can download their admit card from the official website, upsc.gov.in. To download the admit card the candidates have to enter the candidates will be able to download the admit card by entering the registration id/roll number and date of birth.